Turn a pine cone into a colorful turkey to brighten your Thanksgiving table. This is an easy craft project for children that can be combined with some outdoor fun. 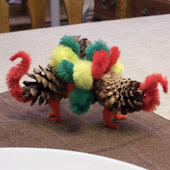 Take a walk in the woods to find pine cones; then, with a little pipe cleaner and glue magic, turn them into little turkeys. This project is great for family, classroom or group craft time. Make one turkey for each place setting, or fashion a few to add to the table decorations. Read through the project and gather all of your materials. Pine cones that are gathered outside may need some time to dry before being used for craft projects. You will also want to check the cones for bugs. If you are doing this craft with a group, precutting the chenille stems and gathering the materials for each child will make the crafting process go faster. Cut the chenille stems into individual bumps. Use wire cutters to cut in the center of the narrow places between each bump. Do your best to keep the chenille bumps plump and fluffy. Fashion a red chenille bump into an S shape. Glue the bump to the open, rounded end of the pine cone, allowing the bump to extend above the pine cone a bit. This forms the turkey's head. The fluffy part of the bump is the turkey's wattle. Bend an orange bump in half to form a V shape for the legs. Glue the V to the bottom of the pine cone, inserting it partially between the cone's opened scales. Form the turkey's feet by bending the ends of the V. You can also fashion feet and toes from orange pipe cleaners twisted onto the ends of the bump. Bend five to seven bumps in half, keeping the centers rounded and fluffy, to form feathers for the tail. Twist the ends together. It's easy to shape a rounded top by wrapping the middle of the bump over a pencil or a pen. Glue feathers to the stem end of the pine cone using a glue gun, wood glue or a good quality craft glue that will dry clear. Use as many feathers as will fit nicely on the pine cone. Only apply glue to the twisted ends of the feathers. If the stem end of the pine cone isn't flat, glue the feathers to a ring fashioned from a pipe cleaner. Let the glue dry, then glue the ring holding the feathers to the pine cone. After the glue has dried, adjust the shape of the chenille bumps to make the turkey look more realistic. If you are looking for cute, glue on some wiggly eyes. When you set the Thanksgiving table, put a turkey at each place setting or add them to the centerpiece for a colorful addition to the table! That's it! Your turkey is done! Thanks to Patricia L. for sharing this craft idea in Aunt Annie's Craft Exchange in 1996. Patricia shared, "I have taught youngsters in Sunday school and youth groups most of my life. I'm always looking for new craft ideas for kids and quite often go into my backyard for craft supplies." 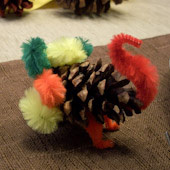 Tip: Set two pine cone turkeys back-to-back for a colorful centerpiece.